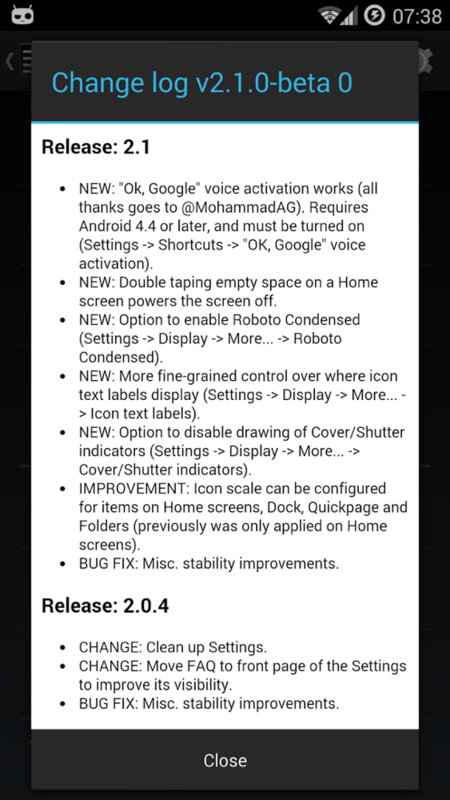 Action Launcher, Chris Lacy’s 3rd party launcher option, received a solid beta update today to v2.1, in case you happen to be participating in the app’s beta program. One of the standout features of the update is the introduction of “OK, Google” hot word support for launching hands-free Google searches, similar to what Nova Launcher just received. That’s not all, though. The update also allows you to double-tap or “knock off,” if you will, to turn the screen off. All you have to do is find an open space on a home screen, then tap twice and the screen will power off. There is a new option for enabling Roboto Condensed, additional “fine-grained” control over icon labels, and improved icon scaling throughout. The update is sizable, so be sure to join the beta and check it out if you haven’t already. Join the Action Launcher Google+ Community. Opt in to the beta group on Google Play. Update to the latest beta via the Play Store app the way you would any normal app. Contest: We are Giving Away 10 Tickets to Lookout's Google I/O Party!